Measurements: 3 x 5 inches, or 76 x 127 mm. Back of card: Practically another card by itself, you might confuse it with a card. An erect, white, winged figure standing on a ram's head in front of a brown field. Around this, a blue border. At the bottom of the card the large letters, "MINNVO". At the bottom of the brown field, not quite as glaring, the words, "INV BRIAN WILLIAMS". Clearly not for inversion. Book included: Yes, 264 pages, 5.95 9 inches, or 15.1 x 23 cm. Lavish illustrations include details & source material. Comments: This is a modern version of the Antiche Minchiate Tarot Deck, which is no longer in print. I have always thought the addition of the extra cards was to make some fussy person happy. I can imagine him demanding of his artist, "Why not include the Virtues? Why not include the Elements? Why not include the Zodiac? Are they not worthy of inclusion? Are they not greater than a mere Pope or Empress? Do they not illuminate the Wheel, are they not the natural companions to the Sun, Moon & Star?, etc, etc." 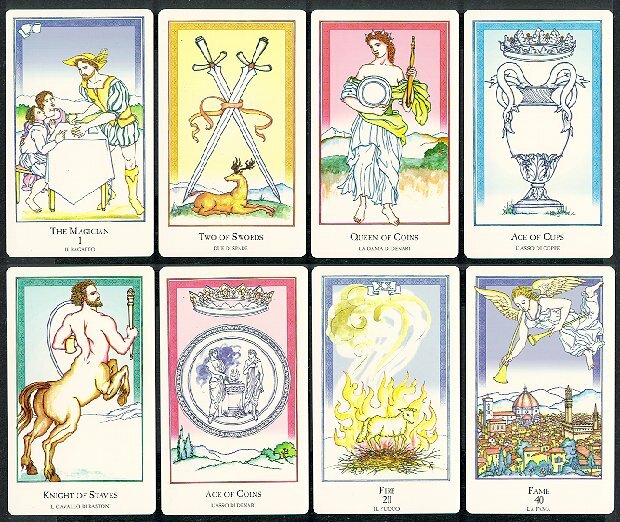 The figures on these extra cards were often sculpted into the great cathedrals, along with many of the regular major arcana cards, in one fashion or another. If you can have them on a church facade, why not on cards? In this deck, the Magician is your waiter, ready to take your order. And what a meal he will serve you! That protuberance on his hat is actually a feather, but feathers come from birds & some folks think the Magician is Mercury & Mercury wears a winged cap. So if you fancy something exotic, this guy can deliver! Notice the cloth covering the end of the table is a pentagram. The book that comes with the cards is excellent in every respect. It is scholarly & lavishly illustrated. Alternative illustrations are given for all the cards. The book helps us to think about tarot, why it became the way it is, and some of the alternative directions it could have taken. This deck & book set is not for the casual, but most certainly is for the curious.